The female in good physical condition is about 5kg and 27cm in height, while the male should be 7kg and 30cm tall. 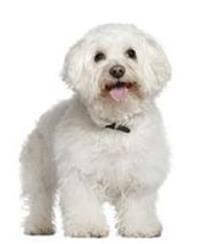 The Bichon Frise requires regular grooming and is not a dog for those who want a ‘no maintenance dog’. It requires regular brushing and combing (at least every second or third day) and needs to be bathed every two to three weeks. The coat does not shed so it needs to be cut every six to eight weeks. The Bichon Frise does not require a lot of exercise, but it loves to walk regularly and loves to run and play in the back yard. The Bichon Frise is suited to anyone who wants a companion dog. The breed is considered to be ‘non-allergenic’, by many people, and so may be the ideal dog for people with allergy problems. It is suggested, however, to visit the breeder and have contact with the dogs before purchasing to ensure that they suit if allergies are a problem.